In France, the best wines are served with the cheese course, just before dessert. 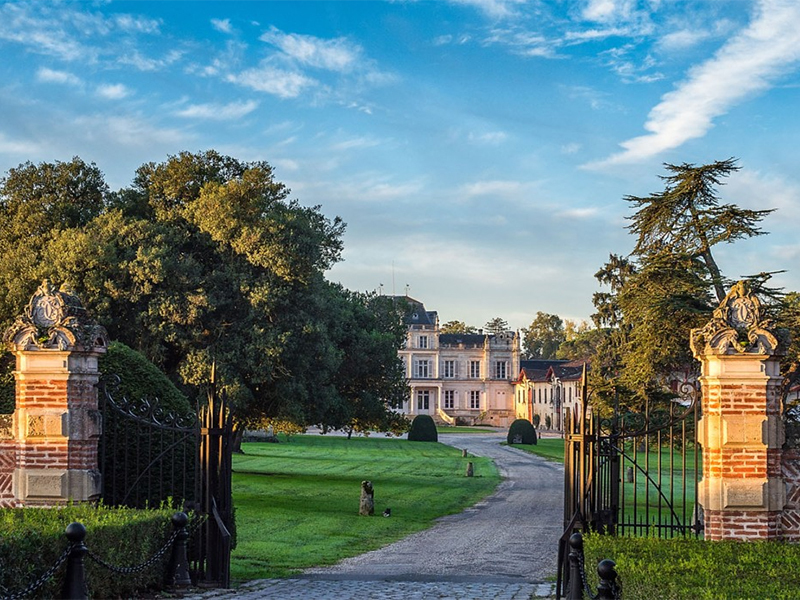 In our case, we were at Château Giscours, a vast wine-growing estate in the Margaux region of Bordeaux for a gala dinner organized by the staff of our river cruise ship, Scenic Diamond. As we cruised along the Garonne and Gironde Rivers in Southwestern France, our 120 fellow guests had been pampered for several days by fine service and excellent complimentary wines at both lunch and dinner on the ship. But the outstanding French wines and wonderful cuisine served at this dress-up affair were particularly tasty. The cheese course included Ossau-Iraty, named the best cheese in the world, accompanied by a superb Château Giscours 2001 Grand Cru. 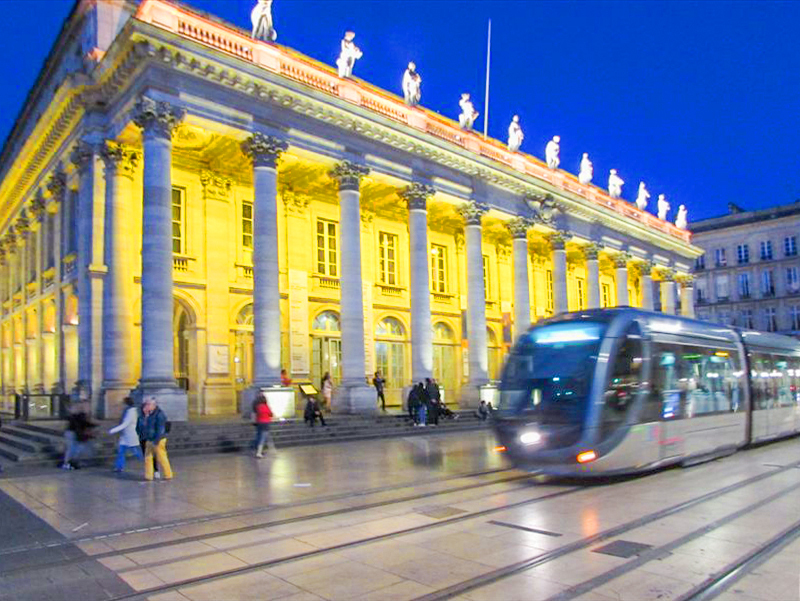 Our week-long Bordeaux cruise began in the city of Bordeaux, a historic UNESCO World Heritage city of a quarter million, second only to Paris in the number of preserved buildings from the 18th century. We stayed in one of them – The Grand Hotel, now known as the InterContinental Bordeaux. The opulent hotel, with its 86 rooms and 44 suites, overlooks the central Place de la Comédie and the remarkable Opera House, dating from 1780. Famed Scottish chef Gordon Ramsay runs a two-star Michelin restaurant in the InterContinental Bordeaux but, sadly, it wasn’t open when we were there. But the celebrity chef also supervises a second restaurant. Brasserie Le Bordeaux Gordon Ramsay emphasizes fresh and local ingredients. His lamb shank, accompanied by onion rings the size of donuts, and his creative lemon meringue pie were special treats. 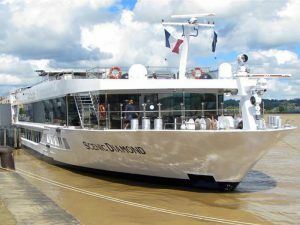 The next morning our ship, the Scenic Diamond, awaited us along the tidal Garonne River. Scenic, an Australian company with a reputation for luxury, now has 16 river boats covering much of Europe and Asia. Our room had a very comfortable bed, a small “sun lounge” balcony (most river ships have only a French balcony) with two chairs, a mini-fridge with pop, water, wine and spirits, and snacks replenished daily. A personal butler is available for any request (ours, named Bora, was wonderful), free laundry is included, and there’s free wi-fi throughout the ship. The high-res TV has many channels and movies available, and every guest has a Tailormade GPS unit for guided tours. Most river ships now have a QuietVox for their tours, and we found the Scenic unit to be a bit large and cumbersome as well as difficult to charge. All tours and gratuities are included with Scenic, and even electric-assisted bicycles are available at no cost. If you like fine wine, this region of France is ideal for touring. The Bordeaux region, with 10,000 wine producing chateaux, includes famous names like Médoc, Saint-Émilion, Graves, Pomerol, Entre-Deux-Mers and, for superb sweet wines, Sauternes. Its 120,000 hectares of vineyards produce over 800 million bottles of wine annually, accounting for a quarter of total French production. All meals on the Scenic Diamond were accompanied by impressive French wines (even Moet Champagne for mimosas at breakfast). This was the first cruise of the spring season and service was a bit chaotic the first evening, but the food and service improved as the week progressed. The lamb, beef, chicken, and pork dishes were wonderful, but all the fish was frozen and varied in quality. Salad choices and imaginative vegetables with French cheeses at the noon buffet were superb. The chef did bring in fresh produce at several stops. Scenic Diamond also has a small, specialty restaurant at the front of the ship called L’Amour. We enjoyed the six-course set menu with perfect wine pairings. The truffle honey with cheese course was especially memorable. 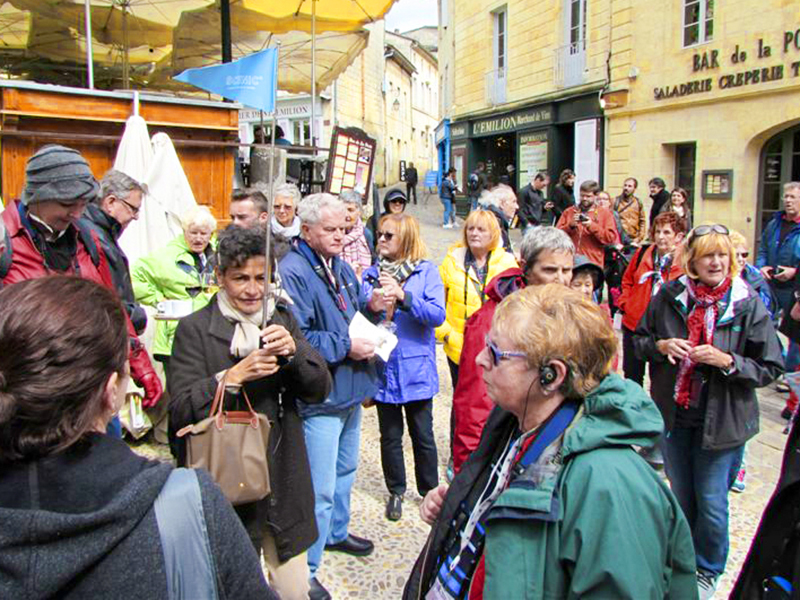 Every day a choice of tours was available, and almost all of them were wine-oriented. 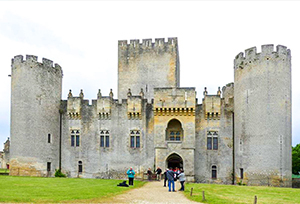 As we could see on foot and from the three dedicated Scenic buses, nearly every square mile is filled with vineyards alongside many impressive and historic chateaux. We visited numerous wineries, some of which were on properties dating back to Roman times. At all of them, we had a chance to sample many outstanding vintages that gave us a new appreciation for the variety and quality of French wine. 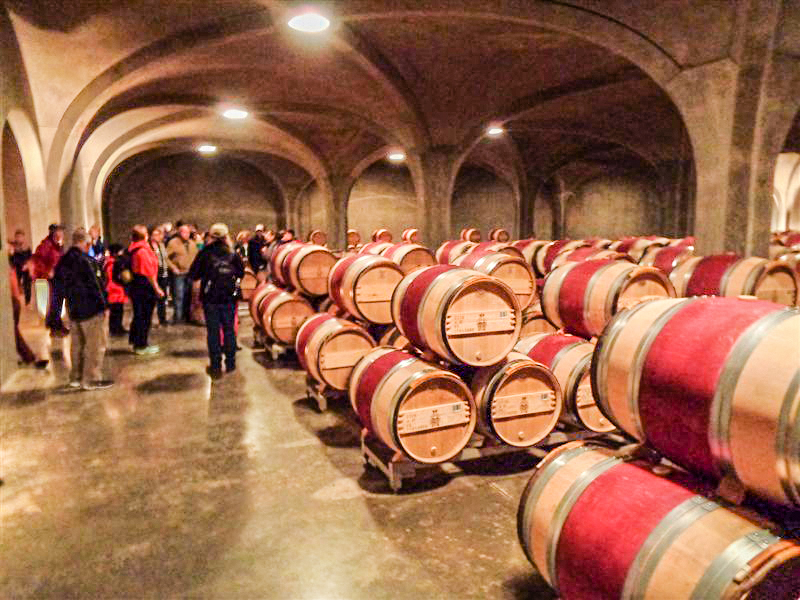 We particularly enjoyed our visits to St. Emilion, known for its full-bodied red wines, especially Merlot. The UNESCO protected town, which now boasts of a wine shop for every eight residents, was named for a miracle-working monk who lived in a nearby cave around 750 AD. Those massive limestone caves, with their consistent temperatures, have been used for wine storage for centuries. There’s even a 12th Century church in the village, St. Emilion Monolithic, that is carved out of the limestone. With the wonderful, rich red wines of Bordeaux, it was surprising to learn that the world’s most famous sweet wines are also produced here, around the small village of Sauternes in the Graves section of Bordeaux. Endless vineyards and huge châaeaux cover the landscape including Château d’Yquem whose exquisite sweet Sauterne can sell for thousands of dollars a bottle. Grapevines and history are interwoven throughout the Bordeaux region, and we visited some remarkable towns (Cadillac, a walled village founded in 1280, was particularly impressive) and castles (the massive Château de Roquetaillade, dating from about 1306, has been lived in by the same family for over 700 years). –All photos by the authors unless otherwise noted.